Kids who grow up in a house full of looms sometimes get the urge to weave themselves. Such was the case with my younger son, who used to beg me to let him weave on "the big loom," a mechanical dobby. I told him he could weave on that loom when his legs were long enough to reach the treadles, and this occurred when he was about 8 or 9 years old. The loom had been threaded with a mixed cotton warp in a point twill, and I pegged the bars for a plain weave, showed him how to wind the gray weft yarn on his bobbins, and turned him loose. The results were great. He wove about three yards of beautiful cloth. We used it to upholster a chair and a bench in his grandmother's house. They're still being used. I visited my mom this morning, and took this photo. 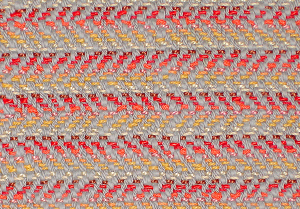 The warp in the picture is running horizontally. Some days I feel this way about my purple fiber, too. I just want to wrap my arms around it. The more arms, the better. 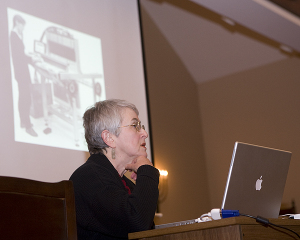 Last night's Upstate Visual Arts lecture was lots of fun. The audience, most of whom knew nothing about weaving, was attentive and asked some good questions. Actually, there were some weavers in the audience, some of whom I'd never seen before. Good to meet you! Bruce snapped away while I was talking. 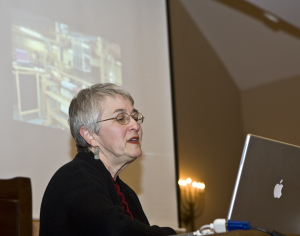 Here are two especially significant examples, because the first one features my slide of the TC-1 with Vibeke Vestby to the left of the loom, and the second slide is one I took in Chico last week of the new AVL Jacq3G. So now the local folks are fully up-to-date on the latest developments in jacquard looms for the handweaver. 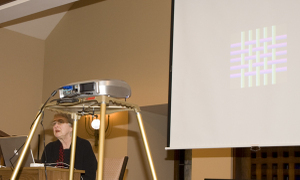 Bruce's next picture is my favorite, because the slide featured on the screen is a basic diagram of plain weave. And I love the way he's used the legs of the projection stand as a framing device. Thanks for the photos, Bruce. Do You Know This Rug? Discovered in the back of my linen closet: a handwoven rug purchased years ago. Source unknown. 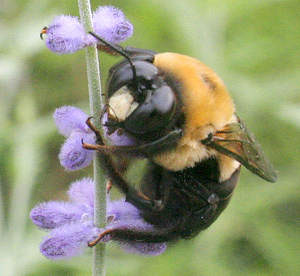 The weave is a type of warp repp. The yarns are cheap, the construction sleazy, but what attracted me to the rug was the structure, and I think in better yarns it would make an interesting project for six shafts. The warp should be relatively fine and closely sett to cover the weft, and the weft should alternate thick, thin, and repeat (reading the treadling from bottom to top, which is the way it would be woven). 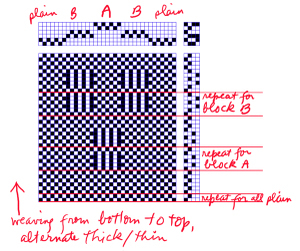 In my analysis, a plain weave selvedge is threaded on shafts 1 &2, block B on shafts 3 & 4, and block A on shafts 5 & 6. 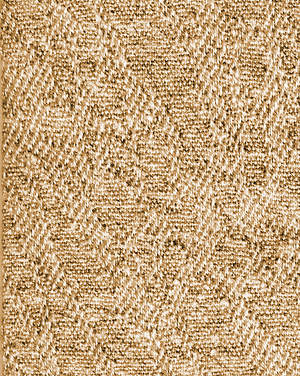 The original rug is mostly plain weave with occasional blocks of A and B woven intermittently. As you can see, alternating colors in the warp adds greatly to the visual complexity of this rug, and having warp color changes occur in the middle of the blocks adds further interest. 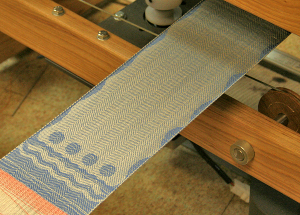 Also fascinating is the way the heavier wefts are deflected around the blocks in the plain weave area. If anyone has any information about where this rug might have been woven (India, perhaps? ), I’d love to hear about it. This jacquard swatch from my stash is in a structure known as Han Damask. John Becker, in Pattern and Loom (now sadly out of print and fetching astronomical prices in the used book market), describes this ancient Chinese structure as a monochrome weave in which the ground weave is tabby and the figures are warp-faced 3/1 twill. If the 3/1 twill is drafted by merely adding tie points to the tabby, the two weaves will work nicely together in jacquard work. The weave works best if it is slightly warp-dominant. The two weaves can be used in tieups or lift plans for block threadings, and also for network drafting based on a 4-end initial. Becker has an interesting discussion of the use of heddle rods in weaving Han Damask. An important part of my day is my daily two-mile walk (Bruce says he’s clocked it at a mile and three quarters, but I know it’s two miles. Besides, after I’ve run up and down the stairs a few times locating my keys, glasses, and sun hat, it must surely add up to two miles). I generally suit up with my iPod and digital camera, and take off. Multi-tasking is the word here. 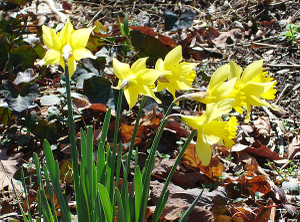 I can listen to Syne Mitchell and WeaveCast and not miss a beat as I whip out the camera and photograph the newest blooming thing in the neighborhood. You don’t know about Syne? Shame on you. She’s literate, passionate about weaving, and has a nice voice. She makes me laugh and cry in equal amounts, a great companion for a walk. And she has just launched WeaveZine, a new online magazine for weavers, which I hope will encourage hundreds and thousands of new people to take up handweaving and increase the weaving population worldwide. That will be good for all of us. The other podcast I enjoy on my walks is David Reidy’s Sticks and String. David is a self-described “bloke,” who chats about his knitting activities and all sorts of other things, like the opera, Australian politics, his cats, and the blue-tongued lizards in his garden. And if you’re a fiber enthusiast, you’ve got to love a person whose motto is carpe lanam. He’s a genial and prolific essayist, and I wish he were my next-door neighbor. 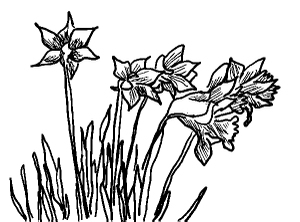 5. indexed to 7 colors. I plan to weave this in samitum, with a 4-shuttle weft rotation. From step 5, the file will be reconverted to RGB mode, all the colors separated out into their own layers, and the weaves applied as layer styles. 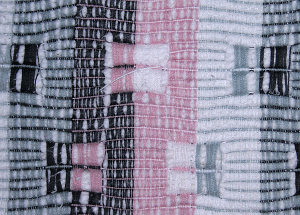 I’ve been thinking about the possibilities of double plain weave with a white/black alternation in both warp and weft. Here is a schematic. 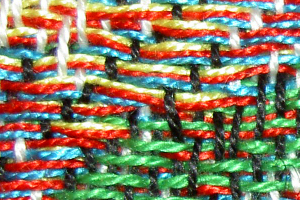 The warp and weft colors are indicated along the top and left. Yellow indicates light or white warp and weft, and red indicates dark or black warp and weft. 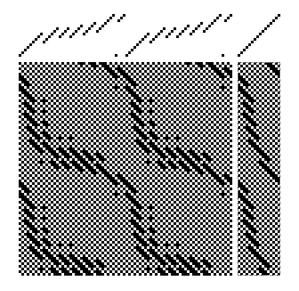 The black and white squares are the actual weave structure: black indicates warp up. 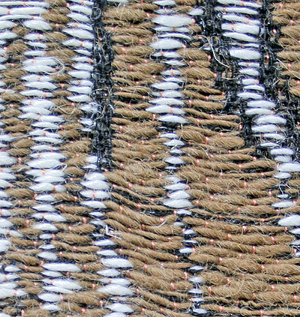 The weave in this example is #1, white warp and white weft on top. 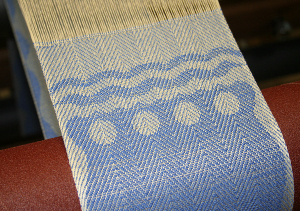 Examples #3 and #4 would appear the same when woven. Likewise #5 and #7; likewise #6 and #8. 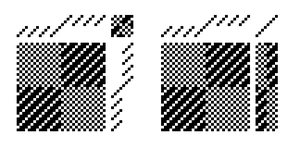 Here are the eight examples, reading from left to right (the green squares are separators). You could use these weaves as pattern presets for jacquard design in Photoshop, or paste them into your dobby lift plans with a straight threading.